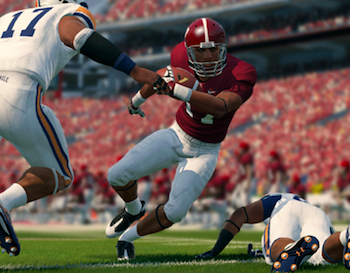 College players win the lawsuit for compensation, as EA cancels any 2014 college football games. While Madden 25 is all set to rake in the millions next month, college football fans might have to wait a bit longer. Since July, legal uncertainty caused the NCAA to not renew its license with EA Sports, but the publisher was determined to continue anyway. Yesterday, EA announced it had cancelled any college football games next year, which was shortly followed by news that the long-running lawsuit had recently reached a conclusion. "Today I am sad to announce that we will not be publishing a new college football game next year, and we are evaluating our plan for the future of the franchise," said Cam Weber, general manager of American football at EA Sports. "The ongoing legal issues combined with increased questions surrounding schools and conferences have left us in a difficult position." Later that same day, both EA and the Collegiate Licensing Company reached an agreement with former college players over the use of their likeness. Mr. Egdorf, an attorney representing the players, referred to it as a "game-changer," saying that "we view this as the first step toward our ultimate goal of making sure all student-athletes can claim their fair share of the billions of dollars generated each year by college sports." While the future of college football games remains uncertain, EA insists that they will continue to support NCAA Football 14.